Las Vegas scored 11 runs a day after being shutout in the second game of their Thursday doubleheader. Night after night, nearly the same story plays out for the 51s. Most of the time, the team gets a solid effort from their offense but they’re not sure what they’re going to get from their pitching. Friday, the 51s won again on the strength of their offense despite a bad night from the bullpen, beating Salt Lake 11-7 at Cashman Field. The 51s offense had a rare off night on Thursday in the second game of their doubleheader, recording just three hits and getting shut out. But the offense snapped out of its funk on Friday with 16 hits in the win. “It’s a little bit different coming out playing two games, two seven (inning games), but I felt like today, right from the get-go, people felt fresh and ready to go,” left fielder Brandon Nimmo said. Nimmo, who was named the team’s Most Valuable Player on Friday, again helped spark the offense with three hits, an RBI and scoring two runs. Behind him, Gavin Cecchini and Michael Conforto also finished with three hits. The trio of Mets first-rounders went 9-for-14 with four runs scored and four RBIs. Plawecki’s grand slam snapped a 2-2 tie in the second inning. After Roger Bernadina homered earlier in the inning to tie the game, Plawecki’s blash cleared the left-center field fence. 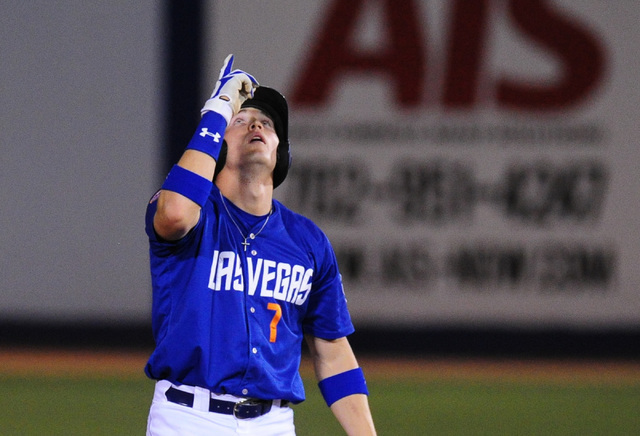 Las Vegas (64-71) looked like it could be heading toward a blowout, scoring two runs in the sixth on a Gavin Cecchini two-run shot and three in the seventh with RBI singles from Ty Kelly, Nimmo and Cecchini. After starter Josh Zeid exited after five innings, Salt Lake started chipping away with two runs off Jeff Walters and three off Chase Huchingson — two earned — to tighten the gap before Paul Sewald nailed down a four-out save. The offense had built up a large enough lead to overcome the bullpen’s rough night.